Despite a 47-save performance from junior netminder Jake Oettinger, the Boston University men’s hockey team suffered a 2-1 overtime loss to Northeastern University in the semifinal round of the Beanpot at the TD Garden on Monday night. 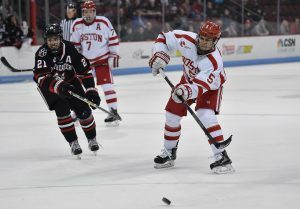 “It hurts, it’s frustrating,” said BU head coach Albie O’Connell, who saw his Terriers (10-12-3, 8-6-2 in Hockey East) knocked off by the Huskies (15-8-1, 9-6-1 Hockey East) in Beanpot play for the second year in a row. As they had in six consecutive games prior, BU conceded the game’s first goal, with Northeastern’s opener coming at the 3:14 mark in the first period. On a giveaway in the Terrier end, senior forward Liam Pecararo provided the feed to classmate Patrick Schule, who fired it past Jake Oettinger to put the Huskies on top. “The first one, [Oettinger] didn’t really have much of a chance on,” said O’Connell after the game. BU squandered two early opportunities on the frame’s only power plays, but eventually found their equalizer with 21 seconds to play in the period. On a pass from sophomore forward Shane Bowers, fellow sophomore Cam Crotty launched a wrister towards Northeastern sophomore keeper Cayden Primeau. The puck fell to Joel Farabee alone at the back post where the freshman forward angled the rebound in off Primeau to tally his tenth goal of the season and knot the game at one going into the break. “I thought Joel was dynamite,” said O’Connell about his standout freshman. In a scoreless second period, Jake Oettinger came up big with some dazzling saves as pressure poured in from the Huskies. BU gained their best chances towards the end of the frame, but could not capitalize. It was the Terrier goal scorer Farabee who had both opportunities for the Terriers, getting in alone twice within the period’s final five minutes but being denied by Primeau on both occasions. Ahead of the final twenty minutes, the teams would retreat to the locker rooms still tied 1-1. “You’d like to bury those chances, but to put yourself in a situation to get two breakaways in a game, obviously shows a high level of intelligence and skill,” said a positive-minded O’Connell about Farabee’s two missed opportunities. The drama continued into the third period, as the tension mounted the longer the game remained even. Northeastern attempted 34 shots in the final 20 minutes of regulation alone, holding a 48-27 lead in shots on goal after 60 minutes. “We were dominating them, so we had all the confidence,” said Northeastern’s Primeau regarding the mindset of his Huskies during their offensive onslaught in the Terrier end. Despite the pressure, Jake Oettinger refused to budge, and both the BU junior and his counterpart Primeau remained strong to keep the game level despite late power plays for both teams in the waning minutes of regulation. The score line would hold after three period of play, and the teams would continue on to overtime. “I thought both goalies were outstanding,” said Northeastern head coach Jim Madigan. The additional frame would not last very long, as the Huskies rallied for a game-winner just 51 seconds into overtime. Taking advantage of a mistimed Terrier line change, junior defenseman Jeremy Davies found freshman forward Tyler Madden streaking into the BU end. Oettinger got a piece of Madden’s shot on the breakaway, but the puck would trickle through, bringing an abrupt end to BU’s 2019 Beanpot bid and sending the Huskies into next week’s final. “[There were] bright lights out there, and I shine in those,” said the confident freshman. For the Terriers, it was the first semifinal loss in a Beanpot tournament since 2014, in which the Terriers were bounced by Harvard 6-2. 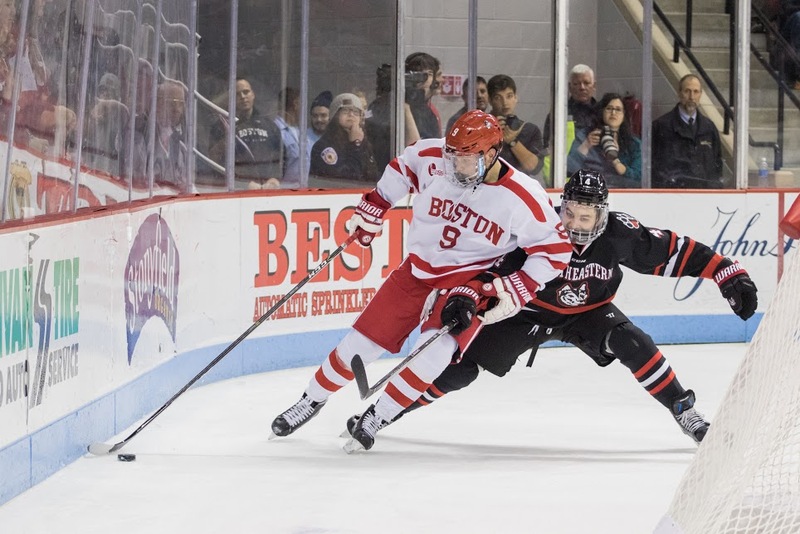 The loss to Northeastern was also a repeat of last season’s championship game, which saw the Huskies overcome BU to win their first Beanpot title in three decades. While he may have finished on the losing side of the game, Oettinger’s 47 saves were his most since last year’s Beanpot tournament, in which the Minnesota native also tallied 47 in a victorious semifinal effort against Harvard. The schedule will get no easier for the Terriers, as they travel to Amherst to visit #2 University of Massachusetts on Friday night before returning to the Garden to face Harvard in the Beanpot’s third place game the following Monday. In the first round of the 2019 Beanpot, Boston University will take on Northeastern at the TD Garden. The Huskies won last year’s tournament, getting a 5-2 win in the final over BU. The Terriers will be seeking revenge, looking to get one step closer to their 31st Beanpot title. It’s one of the biggest games of the year, so come join our live blog! Coverage will start at 7:45pm, with puck drop set for 8pm.